One-drop applicators for prescise use of thin liquids. 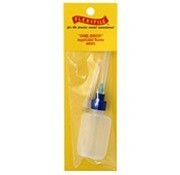 The One-Drop Applicator Bottle allows precise control of solvent cement and other water thin liquids. This product complements the Touch-N-Flow and provides ease when filling and emptying. Available as a 1/2 oz. bottle with 25 and 27 gauge interchangeable steel tubes and protector cap.